Combining the best of both worlds, the antioxidant properties of Fenugreek and the anti-fungal properties of Thyme partner up to be the perfect compliment to your body's natural immune system. 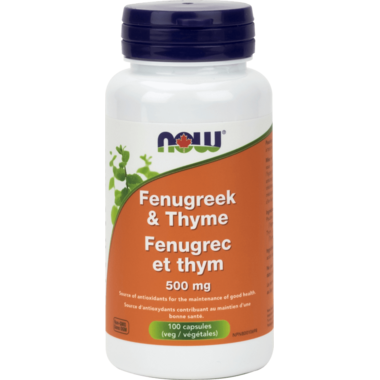 Fenugreek and Thyme are culinary herbs that have also been used by traditional herbalists for centuries. Fenugreek is rich in antioxidants such as naringenin, quercetin, phenols, Vitamin C, carotenoids, zinc and many other supportive nutrients that can aid immune function. Thyme contains an active volatile oil rich in thymol which has shown antiseptic and anti-fungal properties. The variety of Thyme (Thymus vulgaris) used in this product is the cultivated form of wild thyme. Directions: Adult Dosage: Take 2 capsules, 1-3 times daily. Ingredients: Capsule (gelatin, water), Magnesium stearate (vegetable source), silica. Free of: yeast, wheat, corn, soy, milk, sugar, salt, preservatives.